Like its predecessor - the 2006 Hairy Tooth Fairy - this Argentine children's film combines CG-animated characters and live action human actors. It continues the tale of Perez, the sweet-natured, talking mouse whose nighttime job involves slipping into the bedrooms of young children, collecting the baby teeth under their pillows, and depositing coins in return. But that only represents half of his obligations; during the day, he works on a pearl ship, and the demands of two careers threaten to push him to the brink of exhaustion. Then, one night, Perez risks being found out when he slips into the room of Lucas and discovers that the little boy is both awake and waiting for him. 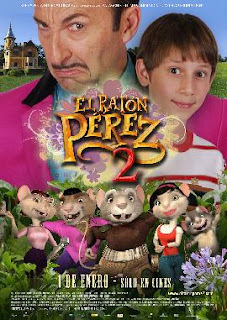 With no other options, Perez waits for Lucas to fall asleep, and dozes off himself; he's then discovered by an attractive female mouse, Lola, who lives in Lucas's residence. The two escape from the bedroom together and forge a fast bond, and Lola teaches Perez salsa and bachata dancing; meanwhile, a vile showbusiness producer named Gil Penkoff devises a crazy scheme that involves capturing Perez, making a spectacle out of him, and turning a profit off of him. To accomplish this goal, Penkoff strikes a deal with Lucas, so eager to catch a glimpse of Perez that he agrees to set a trap for the poor mouse the next time one of his teeth falls out.